From Toronto, I flew to beautiful and sunny San Diego, spending an overnight stay for two important meetings. One was on global clinical study called DOPPS, a major endeavor to valuate and compare clinical practice pattern of the world in the treatment of end-stage chronic kidney disease patients; the project began 10 years ago, almost the time when Google was founded, the fact I reminded to the participants indicating how fast the world has changed. Another meeting was consultative one for a pharmaceutical company with a few world leaders and a FDA consultant on a highly innovative medicine. After some time I felt at back home as a physician and a nephrologist or a kidney specialist. It is a good feeling. Next day, I headed to Abu Dhabi, to participate Festival of Thinkers 2009; I participated previous one as reported earlier (Ref.1). I was on the panel on Globalization and Culture and Language, the theme and the discussion I liked very much. The presence of Japan in this Festival was weak as you may imagine. It seems I was the only Japanese this time in contrast to the Festival of 2007.. It arrived just one day after the final day of FI Grand Prix. Too bad, I missed the event. 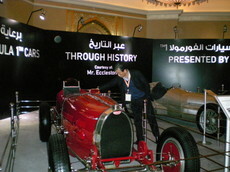 But in the lobby of Emirates Palace (Ref.1, 2) , the venue of the conference, about 12 F1 cars of old and current are on display. What lovely creatures they are. Let me share some of their beautiful bodies and mechanics. One is Bugatti of 1932. For many years, I was intrigued by Jiro Shirasu, thus, when an opportunity arose I introduced books on him (in Japanese). Mr Shirasu studied at Cambridge University, owned a Bugatti and made an unbelievably crazy driving with his life-long friend Robin Byng, one of most notable families, to Gibraltar back to UK in two week through France, Spain, and other places, probably unthinkable speed particularly considering the roads of those days. Other cars on display include vintage Mercedez, Maserati, Ferrari and more recent models. Enjoy the photos.